Testing sensors in cars isn't always the easiest task. In the new 2019 Volvo V60 for example, there’s a new technology called Oncoming Lane Mitigation that can scan ahead of you and detect when there’s a car coming right at you. The automated braking system will engage if needed, but from a journalistic perspective, that’s not a great test scenario. That said, I can attest to the new sensors working better than they have in the past. That’s one of the great blessings (and curses) of all technology: it's always improving, but it's also always in a state of improvement. There are no perfect sensors in cars today – we know that because some of the autonomous driving tech has caused serious accidents. Driving the V60, you can also tell the sensors react differently, and at higher speeds. Volvo first introduced Pilot Assist in 2015 with the 2016 Volvo XC90, and I tested it back then. To engage the adaptive cruise and automated steering, the car had to follow behind another car at speeds up to 30mph. It was meant for stop-and-go traffic on a highway. With the V90, there doesn’t need to be a car in front of you, and the adaptive cruise and automated steering work at speeds up to 80mph. A Volvo spokesperson told me the second generation Pilot Assist was a software update that added the new features. And it's much easier to test. In the V60, the automations worked at all normal speeds. It’s not exactly a new feature – Tesla offers automated driving as well without the need for a pilot car, and so does Cadillac with its Super Cruise feature. I was more interested in Oncoming Lane Mitigation because that's something I have not tested and has not been included in a car I’ve tested. It works by constantly scanning in front of the V60 for an oncoming car. 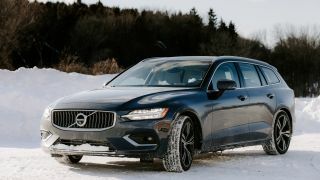 If the sensors detect that you are on a two-lane road and someone is passing a car coming toward you and is now in your lane, the V60 will start braking automatically. To me, it’s proof that sensor technology is progressing. It reminds me of another sensor technology in the Infiniti Q50 that’s a little hard to explain. A sensor scans in front of the car that’s in front of you. So that’s two cars ahead. It can bounce the signal off of the second car and see that is is swerving or braking. Volvo was also quick to point out that the V60 isn't making constant software updates, and doesn't use actual driver data. What’s really happening is a hardware revolution. As the sensors become more affordable and prevalent, the algorithm that tap into that data improve. At one time, only the high-end luxury cars with the best LIDAR sensors could detect other cars. Now it is so common that adaptive cruise control is available in budget cars. It's important to note as well that the V60 can brake when it detects a pedestrian, another car, or a large animal jumping in front of you. These safety features are designed to help the car stay vigilant at all times – something that human drivers never do.